Bycatch is the incidental capture of non-target species, in any fishery. Bycatch poses the most serious threat to dolphins, porpoises and whales. Cetaceans are protected under the Bern, Bonn (ASCOBANS), and Biological Diversity Conventions, the Habitat and Species Directive (92/43/EEC) and are treated as having Appendix I Status CITES, within the European Union. In the UK, they are protected under the Wildlife and Countryside Act, the Conservation Regulations, and the Countryside and Rights of Way Act. There are laws and regulations which prohibit the harassment, abuse and killing of porpoises, dolphins and whales. However, the fishing industry defies all the conventions, regulations, and laws under which cetaceans are protected, and appears to be immune from prosecution. Tens of thousands of cetaceans are dying in fishing nets each year. They become entangled in tangle nets, trammel nets, drift nets, trawl nets, gillnets and long lines. The true extent of the bycatch problem is not known, as many fleets prohibit observers from boarding their vessels. However, studies that have been carried out, show that the problem is of monumental proportions. A study of the French albacore tuna drift net fishery 1992 - 1993 (when only 27% of the effort was observed) showed an annual bycatch of 415 common dolphins and 1170 striped dolphins. In 1995, a study of the UK tuna drift net fishery (when only 28% was observed) revealed that the annual bycatch of dolphins was TWICE that of the French. These drift net fisheries are supposed to be phased out by 2002, but, the powerful tuna fishing lobby, plans to seek a ruling from the European Court to maintain tuna drift net fishing. Studies have estimated that the annual bycatch of harbour porpoises in the Celtic Sea hake gillnet fishery, is of the order of 2237 individuals, but this estimate does not include the bycatch from any UK boat under 15 metres in length, any Irish boat under 10 metres, any of the French boats, or any of the tangle net boats. Neither does it include a proportion of bycaught porpoises which disentangle from the net during hauling, that are already dead. It is estimated that 6785 harbour porpoises are caught in Danish North Sea gillnet fisheries each year, and 1000 in the UK North Sea gillnet fisheries. Many thousands of cetaceans are killed in trawl nets annually, including minke and pilot whales. The trawlers which cause the greatest problem are pelagic (mid-water) trawlers. Available information suggests that potentially high numbers of common, white-sided and striped dolphins are being killed in trawl fisheries in the North East Atlantic each year. Further estimates suggest that up to 50 dolphins may be taken in a single tow by the Irish pelagic trawlers. The most destructive of all pelagic trawlers, are the pair trawlers. The Scottish, French and Dutch pair trawlers tow nets of gigantic proportions. They are so large that 12 jumbo jets could easily fit inside one net. It is estimated that in a six week period at the beginning of this new millennium, in excess of 2000 dolphins died in the nets of French and Scottish pair trawls alone. It is estimated that 6.2% of the total population of harbour porpoises in the Celtic Sea is killed each year in fishing nets, and 4% of the total population of harbour porpoises in the North Sea. The International Whaling Commission has stated that a continual kill rate of only 1% of a cetacean population, will render it non-sustainable. 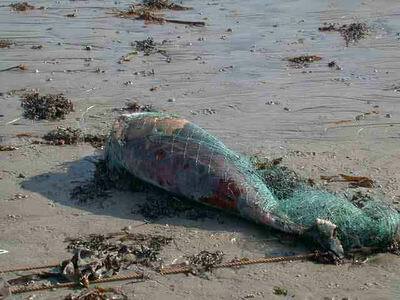 The result of this death and destruction is often seen on European beaches. A small proportion of bycaught cetaceans are found around the coasts of the UK, Eire, France, Belgium, Holland, Portugal, Spain and so on. February 1989: 600 dolphins stranded in two days in Landes and Vendees, France. January - April 1992: 118 dolphins (of which nearly half were positively identified as common dolphins) stranded in Devon and Cornwall - the vast majority showing signs of bycatch; in 1993, 20 common dolphins; 1996, 30 common dolphins. This pattern was mirrored on the coastlines of other European countries. February - March 1997: in a three week period 629 dolphins stranded on the Southern Brittany and Biscay coasts. February - March 2000: in excess of 600 dolphins stranded on the coasts of Cornwall, Devon and Brittany. 11.6% of other whales and dolphins were found to be bycatch. 39.8% of all cetaceans were found to be bycatch. (These figures are likely to be an underestimate, as a cause of death could not be established for nearly a quarter of all those post mortemed). 40.0% of minke whales died as a result of entanglement in fixed ropes, such as creel or mooring ropes. Gillnets, trammel nets, and tangle nets: lacerations on the head, body, fins and tail fluke caused by the net; penetrating wounds, often in the lower jaw and head area, made by gaffs used by fishermen to remove the cetaceans from the net; broken bones; broken teeth; internal haemorrhage and signs of asphyxiation. Drift nets: lacerations on the head, body, fins and tail fluke caused by the net; bite marks on all parts of the body caused by scavengers such as sharks; severed flukes, fins, and tails caused by fishermen using fire axes to remove the cetaceans from the nets: internal injuries and signs of asphyxiation. Trawl nets and gear: deep wounds to the head and body; severed beaks, fins, and tails caused by fishermen using fire axes to remove the cetaceans from the nets, sometimes whilst still alive; severe internal injuries including crushed organs; puncture wounds made by fishermen so that the body will sink and a quite recent development, beheading the animal, sometimes whilst still alive, when it has become stuck in the intake of a fish pump and blocked it. If an ordinary individual carried out these acts of barbarism, the legislative procedure would ensure that the individual was punished. However, the fishing industry appears to be above the law. The problem of cetacean bycatch is not a hopeless one. There are measures that can be taken to significantly reduce the number of needless deaths. Efforts to address bycatch problems in other countries, e.g. USA and New Zealand, are underpinned by targeted legislation and a legal framework of wide ranging duties and powers, including the power of enforcement. In the USA, under the Marine Mammal Protection Act (Amended 1994), the immediate goal was that the incidental mortality or serious injury of marine mammals in commercial fishing operations, should be reduced to insignificant levels approaching zero by 30 April 2001. There has been an assessment of marine mammal stocks; there is a marine mammal mortality monitoring programme for commercial fisheries, whereby, observers monitor the degree of bycatch and then Take Reduction Teams, which develop strategies to reduce cetacean bycatch, formulate Take Reduction Plans, which are discussed with scientists, environmentalists, animal welfare groups, fishery managers and fishermen. The plans are then put into action. In 1994, it was estimated that 2100 harbour porpoises were killed in the Gulf of Maine gillnet fisheries each year. In January 1999, a TRP was put into effect. 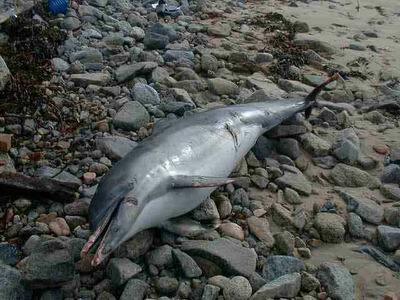 The deaths of harbour porpoises were reduced to 270. In the Mid-Atlantic gillnet fishery, it was estimated that an average of 358 harbour porpoises were killed in nets each year (1995 - 1998). After the introduction of a TRP in 1999, the estimated bycatch for that year was 49 harbour porpoises. Take Reduction Plans, incorporate measures such as, observer monitoring, area closures, reduction in the size of the fishery, pingers on nets and modification to fishing gear and practice. Enforcement measures and penalties, that are sufficiently costly, are used to ensure that fishermen comply with regulations designed to reduce cetacean bycatch. In the autumn of this year a new type of gillnet is being trialled in the USA. It is called an" acoustically reflective gillnet". Trials of this net took place in the Bay of Fundy, Canada, in 1998 and 2000. The results were so promising that the Scientific Committee of the International Whaling Commission, endorsed further experimentation with these nets and the Gulf of Maine Take Reduction Team recommended that a large scale trial be conducted this year. In contrast, very little is being done by the Member States of the European Community to reduce the level of cetacean bycatch. Each country blames the others for the problem. Each Minister for Fisheries blames the others and "encourages" their own fishermen to take measures to reduce bycatch. However, the USA and New Zealand have enforcement measures and the United Nations Environment Programme's Annual Report 1999, states that "The foundation of any successful international, regional, or national initiative on environmental protection, is consensus backed up by law.....there is need for.....detecting and prosecuting violators". The EU Commission has initiated further research into the problem, even though there have been in excess of twenty EU funded reports in the last ten years all showing need for action. Principle 15 of the Rio Earth Summit states that "In order to protect the Environment, the precautionary approach shall be adopted by States. Where there are threats of serious damage, lack of full scientific certainty shall not be used as reason for postponing measures to prevent environment degradation". There is no explicit legal provision in European law to deal with the problem of cetacean Bycatch. Article 6 of the Amsterdam Treaty provides for the legal framework of fisheries policy to be amended to incorporate measures to address environmental concerns. Therefore, the European Common Fisheries Policy could be amended to incorporate cetacean bycatch mitigation measures, with explicit provision in European law. It is now time for the citizens of the European Community to demand these changes, in order to reduce the number of cetaceans dying needlessly, every year, in European waters. The fish are kept in terrible, cramped conditions, as they are intensively farmed; they are continually injected, starved for 7-10days before being killed, and invariably killed in an inhumane way. The CIWF report is a damning indictment of fish farms. In order to provide fish meal for these fish, industrial ships catch millions of tons of pelagic species. These fish die horribly, the majority of them dying as a result of burst swim bladders. Those still alive when dumped aboard the vessels, are gutted whilst alive. These vessels are notorious for high levels of cetacean bycatch. As time is money, if a cetacean is found in the nets, tail flukes and pectoral fins are hacked off, and the animals are decapitated in order to remove them from the net. Their bodies are punctured in an attempt to make them sink - to hide the evidence. These barbaric practices are carried out regardless of whether the animal is alive or dead - post-mortem results have shown this to be the case. We have evidence that levels of cetacean bycatch caused by EU fleets fishing in the waters off W Africa, are even worse than in EU waters. These vessels are also depriving cetaceans of their prey, and we are seeing an increasing number of cetaceans stranding due to starvation. Farming fish does NOT relieve the pressure on wild fish stocks and cetaceans populations. On the contrary, as each farmed fish requires 3-5 times it's own weight in fish meal, in order to survive, the pressure on wild fish stocks is significantly increased, resulting increased cetacean bycatch levels. The pollution from fish farms is destroying the marine environment, destroying wild populations of fish and is causing concern re. human health. Adults have the choice to be vegan or vegetarian - to eat fish or not. However, millions of children have no choice. They eat what they're given. If they eat farmed fish, they are ingesting a cocktail of toxins which have been linked to cancer, disruption of the endocrine system and a number of other hateful diseases. Some adults suffering with certain medical conditions, including problems during pregnancy, are advised to eat oily fish, including salmon, and are unaware that there are alternatives to fish products. They are told that farmed fish is healthy !!! Communities and habitats in the "Third World" are being devasted in order to build fish farms to provide consumers in the "First World" with farmed fish and crustaceans.